We know life can be tough when you are always eating ‘end-of-the-month’ salticrax! You need to balance your budget and make ends meet. All this serious stuff, while all you really want to do is have a good time. At StokeCity AdventurePark we are all about having a good time. So we’ve decided to launch #StudentThursdays! Making sure you have more fun at less of the price tag! 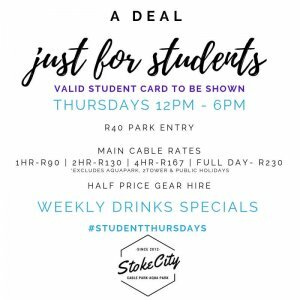 Every Thursday* make sure you have your student ID card with you. Take the afternoon off, and head out to StokeCity at 12pm. On presentation of your valid student ID card, you will get 50% off your cable pass & wakeboard hire. For first-timers, it’s a great way to try out wakeboarding (or kneeboarding), in a non-intimidating environment, where everyone is having a great time, learning and progressing together. Make your Thursday a #StudentThursday and enjoy the stoked side of life!